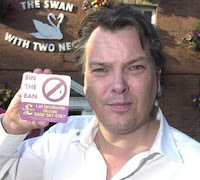 UKIP is to hold a public meeting in Chorley tonight.The meeting will take place at The Swan With Two Necks pub, Hollingshead Street PR7 1EP in the town centre, on Wednesday, October 15th, to enable local people to meet UKIP members. North West chairman Phil Griffiths will be chairing the meeting, which starts at 7.15pm,& will outline the party’s plans both locally and nationally. Well known publican Nick Hogan, whose wife is licensee at the premises, will also be addressing the meeting about the effects of the smoking ban on the pub trade. “This outrageous ban has had a devastating effect on the licensed trade with about 30 pubs closing a week. "I have taken a stand which landed me in court but I am determined to pursue this matter and plan to go to the Court of Appeal. “Publicans should have the right to decide if their pub is a smoking or non-smoking premises or have designated smoking rooms with efficient ventilation systems,” said Mr Hogan. “I am a great believer in the freedom to choose,” he added. UKIP’s North West candidate for next year’s Euro elections, Paul Nuttalll, who is also party chairman, will also be speaking at the meeting. Those present will have the opportunity to ask questions and afterwards meet members of the North West team to discuss any outstanding issues.